This question has already been asked here but for some reason it was deleted, as "dead". I will try to explain again. I have a specific data type. It is used in a large number of disassembled functions. This type has a field whose purpose is unknown. I need to find all references to this field in the entire application. Perhaps there are any plugin? I don't understand why this can be difficult, since to perform this action, it is enough to generate a .c file, open it in notepad and press Ctrl+F. I want this functionality to be in IDA Hex-Rays. However, this only works if the structure has been applied on the assembly-language level. Generally speaking, changing the type of a variable in Hex-Rays does not result in structure cross-references being created. Personally, I think this should be standard behavior. Nevertheless, there's a Hex-Rays plugin called Referee that automatically adds assembly-level structure references based on the Hex-Rays types. There's also an IDAPython port of Referee. 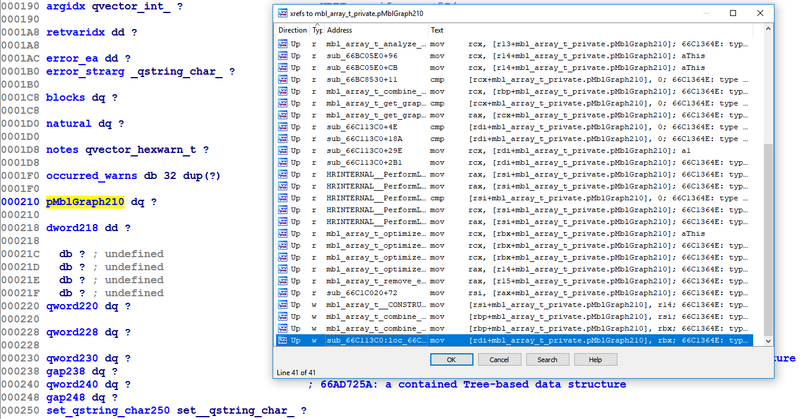 At the time of writing, neither the C++ nor the IDAPython version has been ported to the latest IDA 7.x SDK. How to fix the type of a function pointer call in the Hex-Rays decompiler?